The Cleveland Way is one of the designated National Trails routes which was opened in 1969 and is a walking route full of contrasts with plenty of interesting things to see and do. The Cleveland Way runs for 109 miles beginning in the market town of Helmsley. From there, in a clockwise direction, it follows the ridge of the North York Moors National Park North ending on the coast at Filey. However, although it's only a 30 mile drive between Helmsley and Filey, the Cleveland Way twists and turns North as far as Saltburn by the Sea on the coast, then turns back South and runs right along the coast down to Filey. In effect, the hiking route follows the contours of the North York Moors National Park on 3 sides in a shape similar to a horseshoe. How Long Does It Take To Walk The Cleveland Way? It's estimated to take around 9 days to walk the entire length of the Cleveland Way, but it may take a little longer if you want to stop off and take in more of the sites along the way. Most people tend to go hiking in a clockwise direction from Helmsley to Filey. It's open year round but late summer, from the end of August and into September, is great if you want to see the heather moorland in full bloom. There are many things to see when you're hiking the Cleveland Way but, basically, the walking is split into two parts. From Helmsley, the first section has stunning purple coloured heather moorland. You'll see bluebells in the spring when hiking and you may even spot curlew and red grouse. It also offers you spectacular views of the North Yorkshire Moors while the second part gives you a magnificent view of the coast with some stunning viewpoints. The coastal part of the walk takes you through remote fishing villages like Robin Hood's Bay and Staithes and there's the popular holiday destination town of Whitby to visit where the famous explorer Captain James Cook first set out to sea and where his ships were built. If you fancy a break from the walking, you can also go for a ride on the North York Moors Railway. If you like history, there are Roman ruins with signalling stations dotted along the coastal part of the Cleveland Way which were put there to send a warning of enemies approaching by sea. 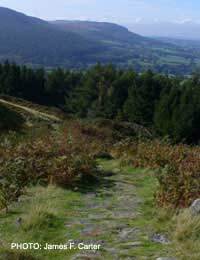 When hiking, you will traverse ancient routes, which include the Hambleton Drove Road. This is the place Scottish Drovers would walk their cattle heading off to various markets as far south as London. At the beginning of the walk in Helmsley, you can visit Helmsley Castle and the historic ruins of Riveaulx Abbey. Built in the 12th century, this Cistercian abbey was once home to a community of 145 monks and 650 villages and is now owned by English Heritage. Rail services connect to York, Malton, Thirsk, Middlesbrough, Great Ayton, Whitby, Scarborough and Filey. Bus services can get you to the start of the National Trail at Helmsley from York, Malton or Scarborough. There are also plenty of car parks located at several points along the trail for those wanting shorter hiking trails. @Smoggieontour. The article is correct. The start point is Helmsley and end point Filey but is not a direct walk from one to the other. The entire route covers many places as the article states: "The Cleveland Way runs for 109 miles beginning in the market town of Helmsley. From there, in a clockwise direction, it follows the ridge of the North York Moors National Park North ending on the coast at Filey. However, although it's only a 30 mile drive between Helmsley and Filey, the Cleveland Way twists and turns North as far as Saltburn by the Sea on the coast, then turns back South and runs right along the coast down to Filey. In effect, the hiking route follows the contours of the North York Moors National Park on 3 sides in a shape similar to a horseshoe." Me again. Just checked the map and it's my understanding of the poor description of th route that's the problem. The Cleveland Way starts off moving inland towards Thirsk from Helmsley, meanderingNorth and 'then' moving clockwise across and down to Filey. Clockwise is an accurate description, I just took Helmsley as the starting point and Filey as the finish point, move clockwise from one to the other and I would not naturally go to the left lol. My mistake though. This information is either out of date or just inaccurate. The Cleveland Way runs through many more parts of Cleveland, Charlton Bank to Great Ayton is a favourite part of mine, Helmsley to Filey? something not right with this info.